Before you start looking for clients online, it is crucial that you have done your research and already have your ideal client mapped out. Competition is fierce online so you must know who you serve and what problem your product/services solves for that person. 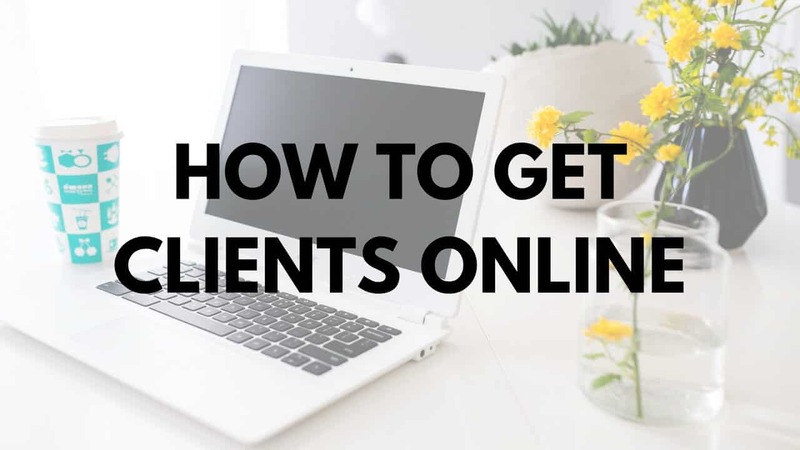 Here are my tips on how to find clients online. Here are ways I get clients for my business month after month. Depending on your situation you may want to go for paid option such as ads where you also get much quicker return on your investment. If you are not in a position to use paid ads I’ve given few options you can use. There are many misconceptions about freelancing sites. When I mention freelancing sites, many immediately tell me that those are “full of low-balling clients” and there’s “too much competition”. First is quite incorrect, yes there are low-balling clients on freelancing sites but way less than you think! There are low-balling clients everywhere, freelancing sites reflect that as well. Truth is that if you offer a high quality service to a narrow niche, you can make seriously good money with freelancing sites. There is next to no competition in the high-end market on freelancing sites! You are most likely one of the few freelancers offering specific service and you can pick new projects even without interviews. I had no interview/discussion for last 10 projects I won on Upwork! To be honest I don’t remember when I last had an interview! I offer niche service on the platform with next to no competition so I have the option to pick projects I work with. Last point, freelancing sites are not just for coders and designers! You can get great clients as a business/life coach, health coach, copywriter, tech virtual assistant, customer support, consultant and more. If you like writing one great way to get visibility is to start a blog on your niche. 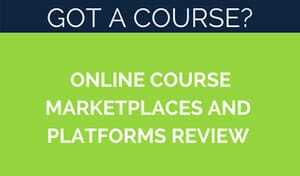 It will put you on the map and can quickly raise your status as an expert on the topic. Even better way though is vlogging! If you are comfortable (or willing to learn) on camera, vlogging is really powerful way to get traction online. Starting a Youtube channel and posting frequent content can literally transform your business in 12 months. Video is one of the most consumed content type today and it will only increase – better start now before everyone is doing it. Ads are quick way to get more clients. You can advertise on Facebook, on Google’s search results and many other online ad spaces. Before you do ads I do recommend doing your homework. It can be a costly project if you are now well prepared for it. Before using ads make sure you have funnel in place to handle all the leads you’ll get. Here’s an example of a simple ad + funnel is a webinar funnel – ad -> webinar sign up page -> email sequence -> webinar -> sales page etc. 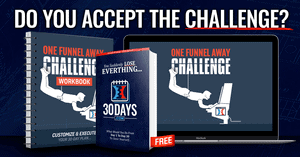 Click to read more about creating an Online Sales Funnel. Social media is an effective way to find clients online. With so many social media platform out there, pick the one that you personally like to use and what your clients are using. Bit of research is necessary as Linkedin, although being a business social network, may not work the best for you. Neither does Facebook pages (read about recent Facebook algorithm changes here). 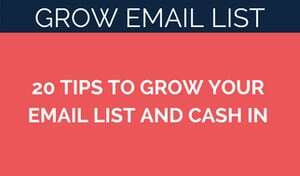 Groups do still work, but many groups are bombarded with spam & sales messages join fews groups with aim to be helpful rather than sell your services. Even better create a group for your niche! That way you can have complete control what happens in the group – plus you get lot of leads just being an admin in the group. If you do blogging or vlogging I highly recommend using Pinterest to drive traffic. You can automate the whole process. I get 40% of my traffic from Pinterest with next to no effort required. 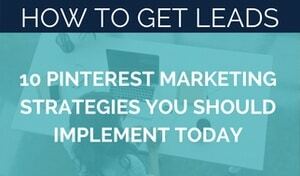 Here’s my Pinterest Marketing Tips. 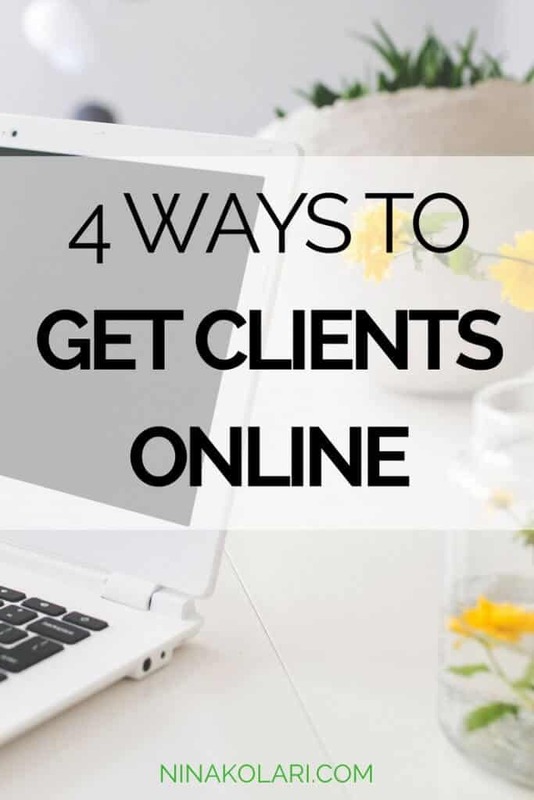 OVER TO YOU… HOW DO YOU GET NEW CLIENTS ONLINE?